With all The Hunger Games hype, people have ALMOST forgotten about Twilight’s Breaking Dawn pt. 2, which will be coming out this November 2012. 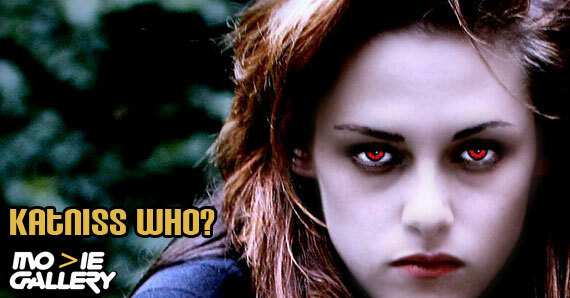 A teaser trailer and 1 actual trailer have recently been released, leaving us Twilight-heads yearning for more. We want to hit the pause button on The Hunger Games for just one moment to take some time to discuss the Breaking Dawn pt. 2 trailers. The first teaser trailer that has been released is 13 seconds short. Really? What could you possibly show us that would be worth while in 13 short seconds? Well, lets face it. Every Twilight fanatic would be happy with even a 5 second taste of the movie, so who’s complaining? I guess that’s why they call it a teaser. Bella running (without tripping) vampire fast. Seeing her new blood red vamp eyes. A few more blissful seconds of an Edward and Bella moment. A poor deer about to become a newborn’s first meal. The trailers definitely did their job. It left us wanting to see more, and for a few brief seconds, we almost completely forgot about The Hunger Games. It’s only a matter of time before they give us a few more trailers, maybe some awesome sneak peeks. All we know is November can’t come soon enough. This entry was posted in The MG Blog, Twilight and tagged Breaking Dawn, Kristen Stewart, Robert Pattinson, Trailer, Twilight by arianned. Bookmark the permalink.